George Edmund Ladbrook was born in Honington, a small hamlet near Shipston on Stour, Warwickshire, in November 1884, his father was George, a gardener, and mother Fannie. He was the eldest of 8 children. After moving to Dinton, Bucks, the family settled in Thame in the late 19th century, where George Edmund was a printer compositor in 1911. 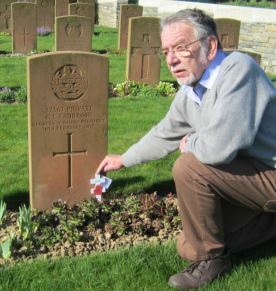 His father had been born in Gloucestershire, and probably the reason why George Edmund enlisted into the Gloucestershire Regiment – Regt No 27367, (2 of his brothers served with the Oxf & Bucks – both survived.) 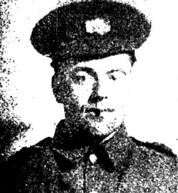 Serving with the 8th Battalion as a Private, he died on 16th February 1917 whilst the battalion was deployed in trenches opposite Serre in northern France, the scene of intense fighting the previous year during the Battle of the Somme. He is buried in the nearby Courcelles-Au-Bois Communal Cemetery Extension,. His accumulated pay & war gratuity of £6 2s 5d, was shared between his mother Fanny, sister Nellie Rose, and brother Frederick William. He is remembered in Thame on the War Memorial, and on the All Saints memorial board.